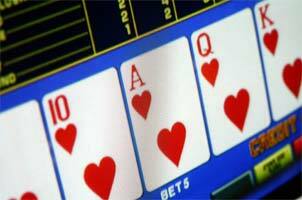 Video poker games are the most popular casino games after the blackjack in all online casinos. From the 1970-s video poker grows in popularity extremely quickly. Some casinos even offer the gambler the greater amount of video poker machines, than slots ones. Why are the video poker games so popular? One of the reasons is that the game is a combination of a slot machine privacy and table game strategy and jackpot. It is the play of skill, as you should combine different playing hands. The aim of the game is to get the best winning hand. Jacks or Better Game is the best known online poker game. Deuces Wild has almost the same rules, as the previous game variation, and all the 2s are wild there. Jokers Wild is something middle between first two variants. If the player has the flush or the straight and the 4 card, he/she should go to the royal flush. 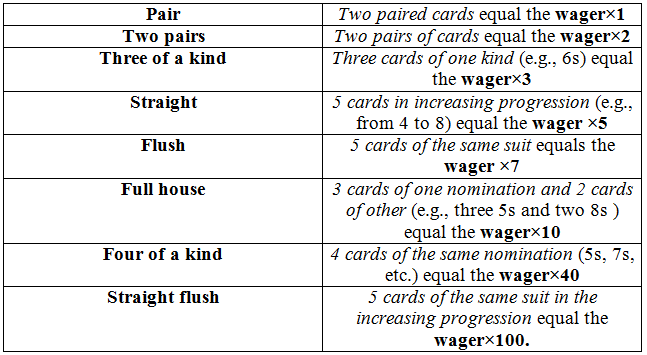 If the gambler has 4 cards to the straight flush and high pair, he/she should go to straight flush. If the 4 cards combination isn't available to you, try to get the 3-card combination. The players are recommended to hold four deuces. If you have the 3 deuces, go to the royal flush or hold the present score. If you have no deuces: hold four to royal flush, stand on the present hand, hold 3 or 4 to royal flush, hold any 3 and pair to flush. These strategies are simplified versions of the optimal play, but you may receive an advantage using at least them.